The Trinity LX Series Gas Fired Boiler is manufactured through NTI or NY Thermal Inc. This is family owned business that offers only high quality and high performance products. 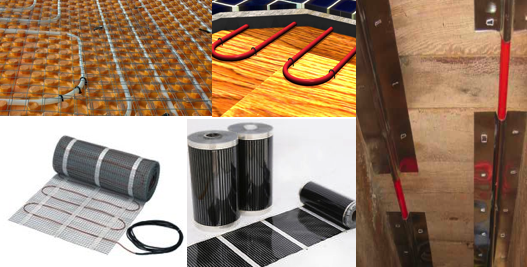 The company is a recognized leader when it comes to product research and product development. 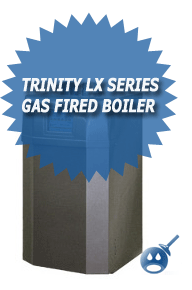 One of their premier products is the Trinity LX Gas Fired Boiler. This boiler has so many important features that it is no wonder they are a leader in the industry. The LX Series Gas Fired Boilers has 4 models to choose from, each one bigger than the next. Which model you choose will depend on the space that you are operating in. The general specifications of the Lx150, Lx150E, Lx200 and the Lx400 are as follows. The Lx150 has an input modulation of 25,000 to 150,000. The unit has a 1 inch water NPT with a maximum pressure of 145. The gas NPT connections are 1/2″ inch and the venting and air size in maximum length is 3” to 105 feet for Natural Gas and 50 feet for Propane. The Lx150E has the same general specifications of the Lx150 expect for the unit weight this unit weighs in at 125 and the Lx150 weighs in at 100 pounds. The Lx200 has an input modulation rating of 25,000 to 199,000. The water NPT is 1 inch and the gas connection is 1/2”. The vent and air size is the same as the Lx150 and the Lx150E. These three boilers measure in at 29.5 inches in height x 17 inches in width x 18.5 inches in diameter. The Lx400 has an input modulation of 75,000 to 399,000. The water NPT is 1-1/4 inches and the max pressure is 145. The gas connections is 3/4″ inches and the venting and air maximum length is 4 inches to 30 feet for Natural Gas and 6 inches to 65 feet for Propane. The Lx400 measures in at 36 inches in height x 17 inches in width x 24 inches in diameter. Some of the other specifications of these models are the Department of Energy Heating Capacity for the Lx150 and the Lx150E is 136,000 and 139,00 and the Lx200 and the Lx400 is rated for 182,00 and 374,000. The important features on all of these boilers are that they are Energy Star Rated and the AFUE ranges from 94% to 97%. Each gas-fired boiler has a 5.7-inch touchscreen display. This offers an easy to read and easy to operate unit. The owner has complete control of the unit and you can customize to fit your heating needs. The Trinity LX Series Gas Fired Boiler has modulation rating of 8:1 and can either be wall mounted or floor mounted. By using the Trinity LX Series, you can help reduce the greenhouse gases of up to 2.5 tons. These boilers have no moving parts and each unit has a factory installed condensate trap. There is a removable door for easy access for maintenance or repair. The Trinity LX gas Fired Boiler can also be used as a potable hot water heater. Contact your sales representative for more information.